I am almost loathe to share this title with you, it’s one of the titles I keep in multiples, so I always have one to give away. I wouldn’t want to create a rush on it, leaving me unable to afford to buy more. Richard Gehman was a writer. You could look him up, he was a successful magazine writer, teacher, biographer, mentor, novelist, journalist etc, etc, etc . . . by the time I read this book he had been dead 10 years. I bought it by the cover, it could have been blank, I’d have bought it anyway. Well, actually I think I got it when I was 15 and slaving away at library sales, back before they became full of soccer mom politics, so I may very well have stolen it. I had become addicted to a form of ‘light non-fiction’ that is no longer practiced. A sort of humorous creative autobiography that would never pass muster in this post Frey-era. Master practitioners were Alexander King, Jack Douglas, Bob Hope; whose anecdotes be they whole truth or whole cloth always go over better in the first person. Gehman’s Hapharzard Gourmet, is in this vein, it just happens to be segmented into ‘recipe’ entries, and sure enough actual mouthwatering concoctions do appear amidst tales, but you gotta read to get at em. I’m one of those foodies who reads cookbooks for fun, I prefer the MFK Fisher kind, but that’s a high bar to set. So I settle for food essay books and cookbooks with more prose than recipes, but very damn few of them can make me droolwith just mere words. Gehman can. 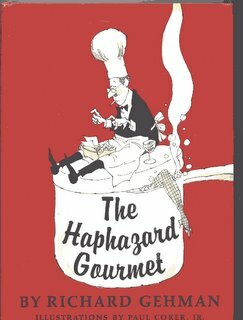 He imparts his mad passions for cassoulet, bean soup, barbecue sauce, caviar, Sardi’s, scrapple, or Tabasco sauce, whether you would normally like those things or not. He wrote some of them most savory phrases I have ever read: “Quick cook beans are for people who eat TV dinners; they are not for you if you have any respect for your stomach,” “The bird will be as brown as a Tahitian maiden when you take it out of the oven,” “Throw in three onions the size of shrunken heads from South American Indians (this recipe can get expensive, for you may have to go to South America and buy a shrunken head to find out how big one is. )” My favorite recipe in the book is for Bean Soup . Here is a .txt file of Gehman’s Bean Soup recipe in its entirety, in the book it takes up 4 delicious pages. I take the book off the shelf and read this recipe at least once a year, by now I can recite it. It’s a good stew of food and humor and wit.